Last night I watched a great little documentary by PBS Frontline about the shift in retirement responsibility. The documentary, available online for free viewing, provides a short history of the pension to 401k historical shift, follows some regular Joes and Janes, and interviews several major executives on Wall Street. The easy to digest one hour long video does a great job exposing the hidden cost of expense ratios in certain 401k plans. Two next door neighbors working the same job and contributing the same amount can have drastically different retirement savings because of these often overlooked fees. In fact, the example given by Vanguard founder John Bogle, was almost 2/3 less savings due to high fees. The documentary fell a bit short in highlighting successful savers who have navigated the somewhat murky waters of retirement savings. Not all 401k plans or choices are bad, and not all pensions were/are good. It is undeniable though that in this day and age, the responsibility for saving and preparing for retirement is ours, not our employers. I gave Shae a new Fitbit Charge HR for Christmas last year. By this summer,the band was already starting to delaminate. She wrote to their customer support asking how to fix it, and their response was, “throw the old one away, here is a brand new replacement”. It seemed like a waste to throw away a mostly working product, so I started using the old delaminating product. 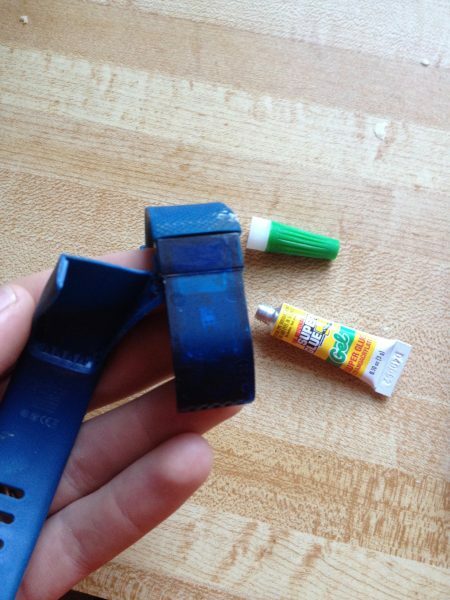 Over the next several months, the band delaminated more and more until one day it completely fell off. I didn’t have much to lose, so I found some old super glue gel I had laying around the junk drawer and proceeded to clean off the fitbit module surface and band surface as best as I could. Then I carefully applied a bead of super glue to the module, refit the band to it, and left it to cure for a couple of hours. Later that day, the fitbit was fixed. I have been using it for about two weeks now and there are no signs of bubbling or peeling. I am not sure if this factory adhesive failure was isolated to this unit or if it affected a larger batch of production. The fix is incredibly easy however. Shae and I have kicked around the idea of buying investment real estate for several years. Today, we finally pulled the trigger. In all truthfulness, the moment came several months ago when we submitted a bid on an apartment building. It has just taken until today to finalize all of the legalese. Buying real estate isn’t for the faint of heart! So what is so special about real estate as an investment tool. In one simple word, ‘leverage’. Putting someone else’s money to work for yourself is relatively easy in the world of real estate. Mortgages are advertised by virtually every bank, credit union, and even insurance salesmen! Right now, we are living in an almost unprecedented environment of cheap borrowing. The prime mortgage rate for a 30 year fixed rate loan is hovering around 3.5%. In fact, that is the rate we secured. I remember when I was a kid and you could have a savings account earn more than that. With money so cheap to borrow and smart people expecting stock market returns going forward to range from 6-8%, it makes sense to seek diversification away from equities and bonds. One extremely popular and well established method of doing just that is owning investment properties. We have talked together for years about what type of property we would want, why that would best achieve our goals, and how we would want to operate it. For us, residential housing, aka apartments, with a buy and hold strategy was a natural fit. Earlier this year, we got serious again about getting out of the armchair and into the field. We ran numbers on dozens of different properties for sale. I adapted a simple back-of-the-napkin model from BiggerPockets.com and used that to get a better idea of how different properties sized up to one another. Eventually, we started to get a feel for our local market. There were some abysmal numbers out there, a lot of mediocre ones, and some that seemed too good to be true. We started calling realtors and visiting places in person. Sometimes the numbers lined up with what we saw in person. For example, one place had an amazing rate of return on paper, but in person it was obvious that it was a high turnover, hard to collect rent type of place. When the tenants have smashed holes in the drywall, you run the other way as fast as your legs can carry you! Eventually, we spotted an attractive looking quadplex that ticked off all our checkboxes. It had a simple geometry, was purpose built for apartments, good neighborhood, and was taken care of by a respectable owner. The ask price was 170k. We offered 151k. Other buyers put in bids, counteroffers ensued, and we eventually won with an offer of 156k. Below you can see our napkin investment math. 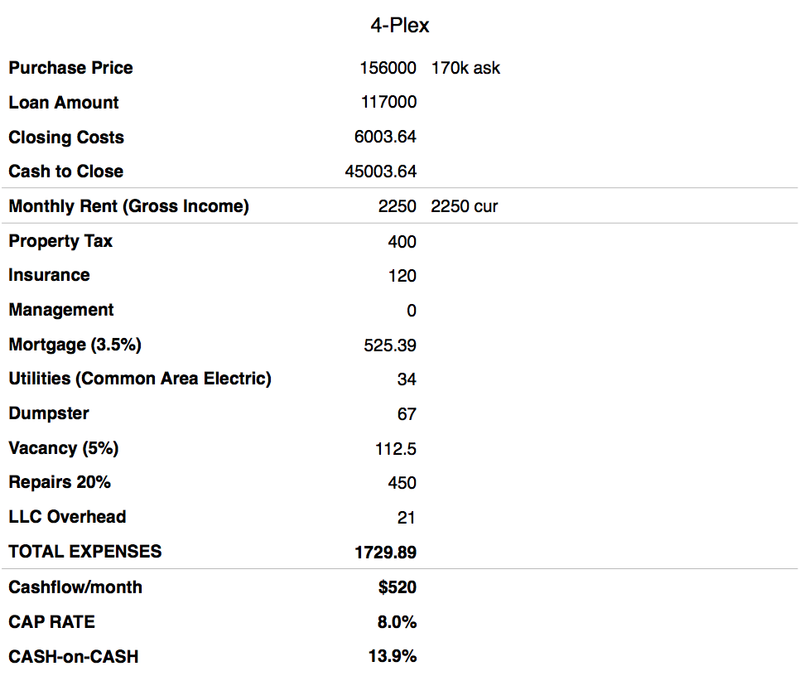 Monthly Rent through Total Expenses are on a monthly basis. The CAP RATE, or capitalization rate, would be the investments rate of return. Leverage is what makes the work worth it though. CASH-on-CASH is the rate of return that we are forecasting for the profit, cashflow/year divided by the cash to close. In essence, we made an investment of 45k dollars and expect to make 6k a year in profit. Of course, only time will tell how well it actually performs, but at some point you just have to jump in and start swimming. The other huge benefit of real estate is depreciation, but I’ll get into that closer to tax season.